Once an hour, ThirdMate makes a logbook entry with your location, course, speed, and, if your device has an atmospheric pressure sensor, barometer reading. Like a reliable officer, ThirdMate also makes a log entry when you change course or speed and when the barometer changes. ThirdMate is a very easy to use marine virtual assistant. The 3rd Mate is traditionally the officer in charge of keeping the ship’s logbook up to date. As an assistant ThirdMate keeps your log, keeps track of current weather forecasts, and does things like remind you that sundown is near and it’s time to turn on your nav lights. You can make our own log entry any time you want using the keyboard or speech-to-text. Make notes about weather, sea conditions, radio conversations, nearby points, other vessels, gauge readings, engine room checks, when you turn on your nav lights, bunkering, supplies, drills, inspections, anchor depth, the list is almost endless. ThirdMate can set a notification to remind you to turn on your nav lights before local sundown. ThirdMate is a simple and easy way to follow recommended watchstanding guidelines and procedures. 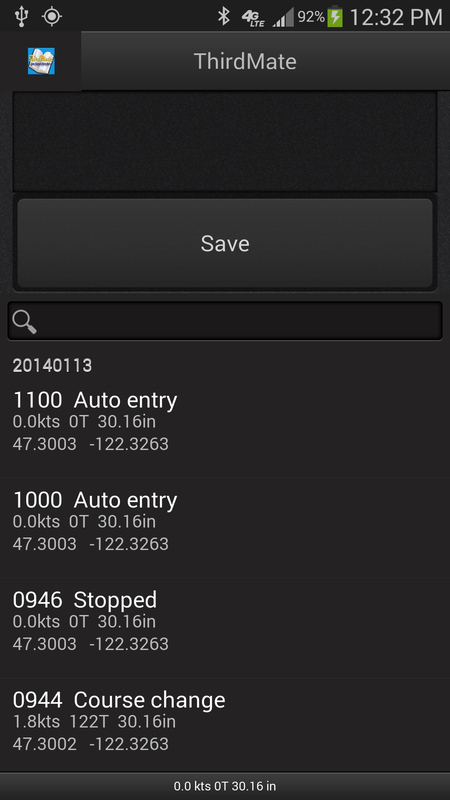 ThirdMate stores log data locally on your device. You don’t need an internet connection or any type of subscription. The day’s log is sent as email either in text or comma delimited (csv) form. You can also generate a KML file to be used with Google Earth. This allows you to safely and permanently store all log data. When you connect your phone or tablet to your computer via USB it looks like a removable drive. 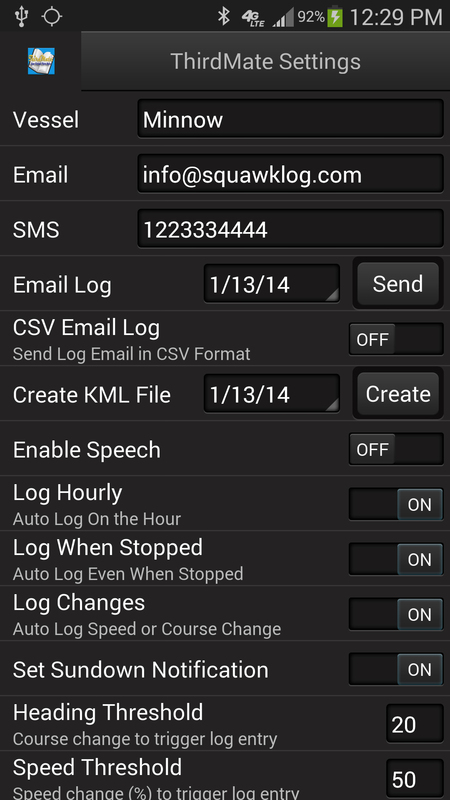 KML files are on this drive in the Phone\Android\data\com.SquawkLog.SquawkLogger\files\ folder. You can move these files to your computer’s hard drive by simple drag-and-drop. Uses internet connection to retrieve weather data. This is controlled in settings. See www.SquawkLog.com for more details and our other apps. SquawkLog Solutions, LLC - Aircraft Management Made Easy!